Well, Sapphire is settling in. Bobby has not really paid much attention to his new house mate, other than the occasional hiss and a deep growl. Sapphire wants to play, Bobby wants his house back. We will see how it develops! She has taken to her wet kitten food, as has Bobby, and she has found a variety of places to rest her head. 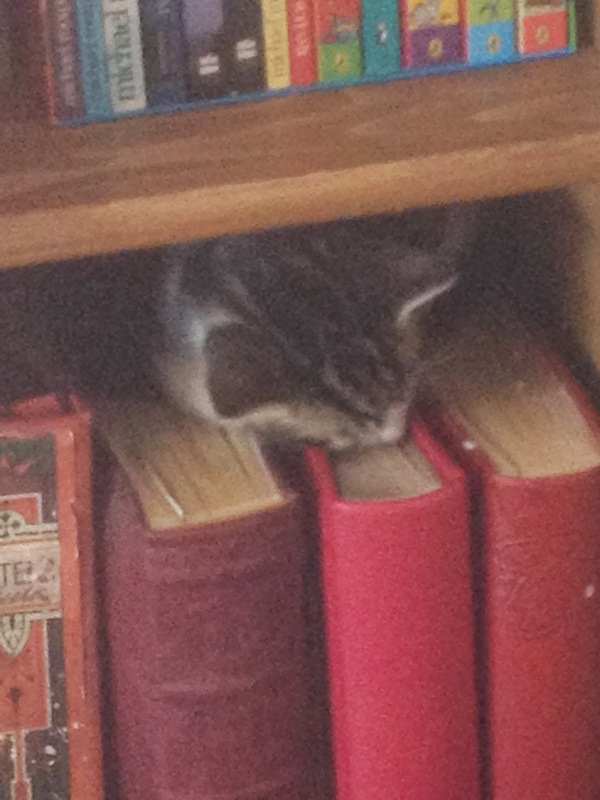 She shows all the signs of being quite a clever cat, in fact a bit of a bookworm! In other news – my target weight has now been reached! But what next? How do I maintain it? Just put a batch of chocolate digestives in the oven – I’ll have a coupe of those whilst I think about it! Plans for The Raven are coming along nicely. This is a narration of the Edgar Allan Poe classic poem, including in depth analysis from Nosferatu, a random zombie, and, of course, The Raven! It will be staged in July at Buxton Fringe Festival. There will be four shows at the Pauper’s Pit, and as this theatre only holds 40 people you may want to book tickets early! For more information visit www.tumbattle.co.uk. The ‘threat’ of the end of year Prom Party gets ever more real. That’s Ole’s year not Zac’s. Anyone got any spare sick buckets? And so onto the patter of tiny feet, no, its not Sapphire. Gabriella and Matthew have proudly announced that they are to become parents in November. So congratulations to the pair of them. But what about me? And Zac? Zac thinks 12 is waaay to young to be an uncle, and at 53 the name Grandpops is hardly appropriate (actually I’ll be 54 by November). It all seems like a twisted plot from Coronation Street.